Dial a Digger offer a choice of BLEC machinery for sale. 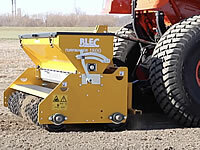 The BLEC Cultipack Seeder has a world renowned reputation for its well proven seeding system. 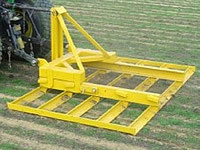 The front nothched ring rollers crush lumps, making small pockets in the soil, the seed is spread accurately across the full width of the machine - not drilled in lines, the rear set of rollers split the shallow tidges, covering up the seed in the top 12mm of soil Surface distrubance is kept to a minimum. A fast and effective way of seeding all areas, the low ground pressure exerted by the Cultipack Seeder makes it particularlry effective on sensive ground. 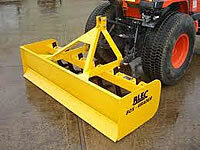 The BLEC Power Box Rake is a multi-use quick fit attachment to suit the BCS 2 wheel tractor. The pwerful contra rotating carbide tooth rotor can penetrate hard ground producing up to 75mm of soil pulverising, levelling and grading. The bi-angling rotor allows stones and debris to be windrowed to the side and by folding down the side end plates excess material can be easily collected up into a pile. 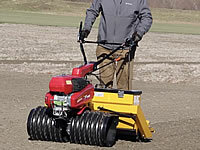 The BLEC Turfmaker Seeders are based on a proven method of seed incorporation. the front notched ring rollers crush lumps and level the soil to create a firm surface also producing small pockets in the soil, ready to accept the grass seed, which is spread the full width of the worked area (not drilled into lines). The rear set of rollers split the shallow ridges formed by the front rollers - incorporating the seed evenly in the top 12mm soil, and surface disturbance is kept to a minimum. The BLEC Rotor Rake is available with either the multi-tine fine tooth rotor for raking stones off down to 20mm size or the alternative bolt on long tine for deeper raking down to 10cm and removing stones from 25mm and larger. The rake is fitted with a hydraulic bi-angling rotor wtih duplex chain drive, overload clutch and heavy duty gearboxes. The working principle is simple but effective - a contra rotating rotor fitted with high grade teeth positioned in a spiral sequence forking out unwanted stones and debris to the front and by angling the rotor all debris is moved to the side leaving a clean raked finish. The Rotor Rake is popular for 'cleaning' during the renovation of hybrid surfaces. 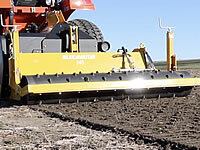 The BLECavator compact series has been re-designed to work more efficiently. 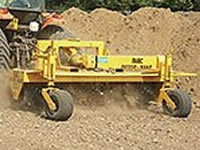 This well proven standard BLECavator is a one pass ground preparation tool, cultivating and digging down to between 10-18cm lifting and screening the stones and debris down to between 14mm-50mm through the adjustable tines - burying the stones and debris, raking the ground level and compacting the soil with the rear packer roller. The BLECavator heavy duty series are all equipped with a long life drive system, and side gear drive (no chains), larger diameter screening tines, easily adjustable to achieve screening sizes of 14mm-20mm-40mm-52mm, and a curved rotor hood made from 6mm steel for strength and durability, adjustable levelling blade for accurate grading and rear packer roller, ballastable with water for firming up the surface. The BLEC Laser Grader is designed for the contractor who demands a quality, strong and accurate grader to cope with demanding conditions. This model is fitted with twin Danfoss proportional valves and a rear 4 wheel frame, with each pair of wheels controlled independently for dual grading. The BLEC Laser Graders come complete with ripping tines. The grader is set up to accept any make of laser equipment. The range of BLEC Trailed Graders are manufactured to a high standard using quality materials for long life. All models have a 4 wheel frame - with each pair of wheels controlled by their own hydraulic cylinder for dual grading or all 4 wheels can be locked for single grading. For the accurate levelling of sports areas, ranging from golf tees to sportsfields. 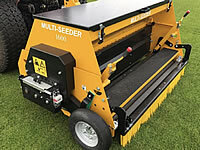 The BLEC Multi-seeder is an ideal overseeder for working on both fine turf and amenity type areas. The floating twin spike rollers follow the contours, saturating the surface with small 'flower pot' holes ready to accept the seeds, which are spread accurately via the stainless steel metering sections adjustable from 0-50 gms per m sq. 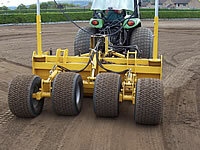 A drag brush sweeps the remaining seeds into the holes, and a rear smooth roller firms up the surface. 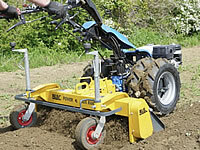 The tractor mounted BLEC Power Box Rake is the perfect landscape construction tool for carrying out cultivating, earth moving, grading and raking. At the heart of the unit is a carbide pointed tooth rotor whcih contra rotates, pulverising and separating the debris from the soil, leaving a clean raked finish. The hydraulic bi-angling rotor windrows unwanted stones and debris and by folding down the side plates all the raked material can be gathered up. 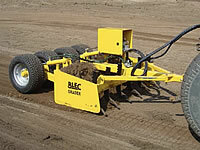 The BLEC Bar Graders are ideal for grading soil and stoned areas quickly and easily. the angle iron bars are positioned to carry out grading and earthmoving in the forward position. By simply removing the locking bar, the quick hitch frame can be positioned in reverse so the bars back blade and smooth the surface. The BLEC Box Scrapers are a low cost, easy to use landscaping tools, ideal for cultivating, levelling and clearing - a must for the contractor. Adjustable ripping tines can be raised clear of the ground or set down to rip up the ground, the 'box' effect will allow soil to be dragged forward filling in any undulations, the reverse blade will backfill or back blade very effectively. An optional wheel kit permits accurate grading. Also ideal for grading stone/gravel roadways.